Elite Big and Beautiful contains 10% high quality silk worm pupae, White Fish Meal, Antartic Krill Kusuri Klay, ‘Optimum’ food enhancer and Pre-biotics as well as many other high quality ingredients. 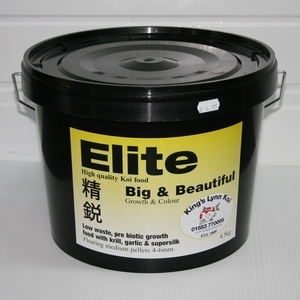 Elite Big and beautiful is a very special recipe , and has the ultimate ingredients for feeding to produce excellent growth and colour improvements in Koi. Due to the Silkworm pupae, this food is best fed at temperatures over 14c. Silkworm protein is acknowledged by Japanese breeders as the ultimate ingredient for feeding to improve colour enhancement. Silkworm pupae have a unique type of protein and silk oil properties that can easily be digested.